Boys and girls, allow me to weave you a detective story, a story of meticulous research and what it uncovered and proof of the point I wish to make. An intriguing start to today's week. I conducted an interment at a local cemetery early this morning and after my benediction and parting words of consolation to the family, I stepped back and wandered amongst the gravestones until my car was freed from the family that parked around it. I'm not morbid, but what people see as a graveyard, I call God's library. Each stone represents a life that has a story behind it and in my humble opinion each story carries with it inherent value and meaning. I agree with a quote attributed to Theodore Roosevelt: "Each death is a tragedy for if it is not, than life has become one." So I browse the stone library that people call a graveyard and marvel at the names and the dates and the small expressions of faith and comfort that some have engraved on the markers. Within minutes I was joined by three of the most charming and intelligent young ladies I have ever had the honor to meet and they had incessant questions about the gravestones and the families they represented. The oldest was no older than 10 and with them leading the conversation we discussed graveside and funerary traditions, the differing aroma of flowers, the difference between marble and granite, and whether family lines can die out. The dissonance of walking in a necropolis with three pretty young things bursting with energy and life was, admittedly, an odd experience of contradictory emotions. Nonetheless, I cannot deny I was charmed by the unexpected company in spite of the incongruity. I shall mark today with a white stone. For some reason I felt impelled to prove my point that every life is a story, so I selected a gravestone at random. Now I have absolutely no idea who this young lady is, except that she tragically died at the age of 16. So armed only with the Internet, I decided to do some research into the life of a young lady who is probably forgotten even by what of her descendents are still living. Miss Theola E. Logan, 16-year-old daughter of Mr. and Mrs. Otis E. Logan, Biglerville, died very suddenly at her home in Biglerville Saturday evening at 7:30 o'clock. Dr. C. G. Crist, Adams county coroner, and Pvt. Prank Yercavage of the local detail of state police, investigated. Dr. Crist ordered an autopsy by Dr. C. Harold Johnson, pathologist at the Warner hospital, which revealed death "was due to a hemorrhage at the base of her brain. I was genuinely surprised that a 16-year-old girl would pass away from a brain hemorrhage. In today's medical terms, it is quite likely Theola passed away from a brain aneurysm, a weakness in one of the arteries of the brain. And yet, she had appeared healthy to everybody who knew her. Curious, I explored her life a little further. 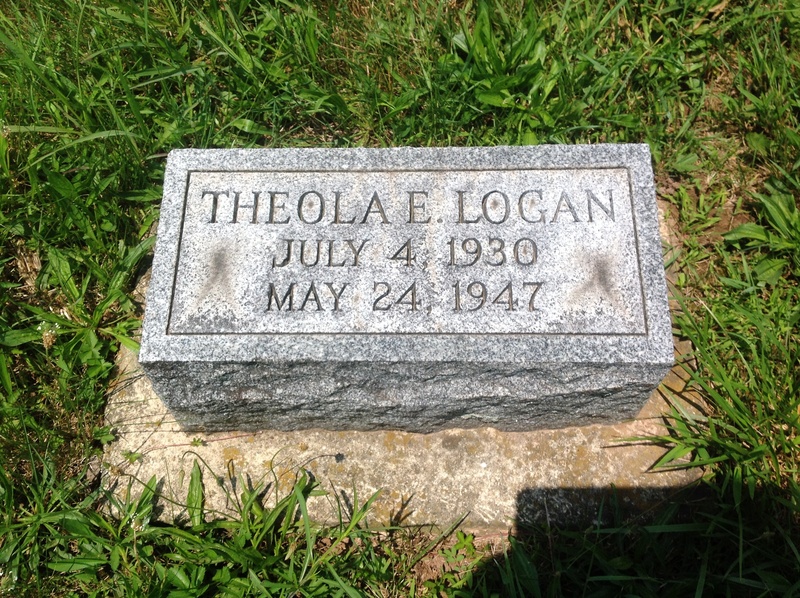 Theola's father, Otis E. Logan, passed away March 13, 1986 and I discovered he was a true war hero. In World War II, Theola's father served with the 393rd Infantry. On Dec, 17, 1944, when Theola was only 14 years old, her family received the news that Otis Logan was reported missing in action in Germany on the Western front. Four months and 12 days later on April 29, 1945, he was liberated from Stalag 13C and afterwards received the Purple Heart. Can you imagine the horror the family felt and then the resulting joy when they discovered the patriarch of their family was still alive? It was on the page that spoke of Mr. Logan's heroism where I came across a valuable clue that led to a very reasonable conclusion as to what caused Theola's passing. A simple notation noted that Otis E. Logan's father, Otis A. Logan passed away on May 7, 1947 at the age of 76 years, 5 months, and 6 days. Theola passed away 17 days after the passing of her paternal grandfather. Is it possible that the stress of her grandfather's passing, a combination of grief and loss and the change in everyone's life when a family member passes (much greater in the 40's than today when families live so far apart) increased Theola's blood pressure to such an extent, it triggered the time bomb in her brain? That as this poor child prepared to go to the theater with friends, blood pressure caused the aneurysm to rupture? Hard to say, but the conjecture is truly possible. By the bye, she was survived by three sisters: Dawn, Mary, and Betty. 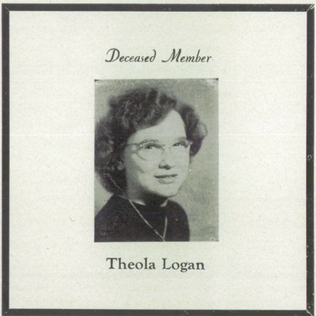 Also, Theola's memory did live on for a time as I found references to a "Theola E. Logan commercial award," but sadly could find no other pertinent information. Also, the name Theola is a rare one. It is Greek for the word, "divine." And just as a closing fact of interest, what was the movie picture Theola was going to see that fateful day when she entered eternity? Hard to say for certain, but she had a choice of three. You may have heard of them: Great Expectations, Miracle on 34th Street or The Ghost and Mrs. Muir. And this is also what motivates me. You did a very good job of writing it. After reading what you have written, I doubt that event A was related to event B. I have have had a very elderly Aunt, uncle and daughter all died within a week of one and other. The uncle from cancer, my aunt died in her sleep, they had been we'd 75 years, and their daughter a week later from an aneurism. It was just one of those things. Related? Maybe the aunt and uncle, but the episode that killed the daughter was something she was born with. Just one of those things. And I believe that this is one of those moments. Life is fragile, each second a miracle. This is rather an amazing piece of work, Heavy. Thanks for sharing it. Maybe I should check out some of the names on the older headstones in our local cemetery and see what I learn. This is beautifully written and I'm really impressed with how much you were able to dig up. I think about things like this a lot myself. But I AM, most assuredly, of a morbid bent. I was spellbound as I read this. Great writing and research. I love old cemeteries. They has a story to tell. I was fortunate to have pages from my great grandfather's Bible brought to me at the first family reunion in 1989. In the listing of Deaths one of his sons was noted "Killed in Virginia fighting for the Confederacy" but it was marked through because he was a prisoner and came home to live to a ripe old age.